Köln (Cologne) is situated at an elevation of 46 m on the river Rhine and is the seat of the administrative region Köln of Germany's state of North Rhine-Westfalia. With a history of almost 2000 years, Köln is the oldest metropolitan city of Germany. Agrippina, wife of the roman emperor Claudius, was born here in 16 AD. The military post was elevated to a town, Colonia Claudia Ara Agrippina, in 50 AD. The Romans also introduced the Christian faith to Cologne, which soon became the seat of a bishop. The Frankish tribes conquered Cologne in 454 AD, which ended the Roman rule. 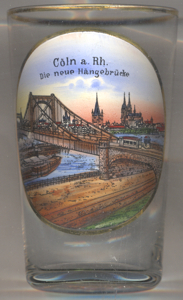 Soon after that, Cologne gained importance again as the residence of the Frankish kings. Emperor Charles the Great (Charlemagne) founded the Archdiocese of Cologne and also gave full sovereignty over the region to the archbishops. During the following centuries, the archbishops became one of the most powerful princes of the Holy Roman Empire. When, in 1164, the chancellor of the Empire, Archbishop Rainald von Dassel, brought the persumed bones of the Holy Three Magi to Cologne, the city became an important pilgrimage site. The famous cathedral was founded in 1248. Apart from the cathedral, 12 Romanesque churches emphasized the religious status of Cologne. The rule of the Archbishops over the town ended in 1288, when the troops of the citizens of Cologne defeated the archbishop in the Battle of Worringen. Since then, the archbishops of Cologne resided in Bonn (until 1821). 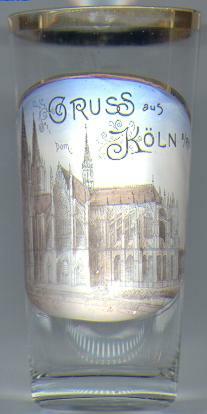 The university of Cologne was founded in 1388, being the first municipal university of Germany. The town obtained the status of a Free Imperial Town in 1475. It lost this position in 1794, when it was occupied by the French troops who also closed the university. After the Peace of Lunéville in 1801, Cologne became part of France and was the seat of a sous-préfecture within the département de la Roer (capital at Aachen/Aix-la-Chapelle). After the Napoleonic Wars, the Congress of Vienna decided in 1815 that Cologne and the Rhineland would become part of Prussia. The Prussian rule soon became the object of ridicule; the tradition of the famous carnival of Cologne began in 1823. 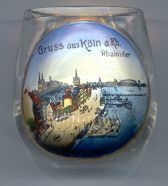 Nevertheless, the industrialisation of the 19th century, made Cologne the second-most important city of Prussia after Berlin. The town was connected to the railway lines in 1859, the old fortifications were torn down in 1881 and replaced by representative boulevards. In 1933, the Nazis gained power and deposed of the mayor, Konrad Adenauer (who later was President of the Federal Republic of Germany). In 1936, the Wehrmacht occupied the Rhineland, which since the end of World War I had been a demilitarized zone. Until 1943 all Jewish inhabitants (about 11,000) were deported. After several bomb raids during World War II, 90% of the old town were destroyed. It took until 1972 to rebuild the most important parts of the city. The most important landmark of Cologne certainly is the famous cathedral. The church was founded in 1248 as a shrine for the reliquiary holding the bones of the Holy Three Magi. The construction works went on until the mid 16th century. It took until 1842 that the building works were resumed. The church was finally completed in 1880. The two towers, modelled after old plans, have a height of 157 m. The large bell, named for St Peter, was cast in 1923 in Apolda and until 1998 it was the world's largest freely swinging bell (about 24,000 kg). The previous bell (Kaiserglocke, Emperor bell) was even larger (27,075 kg); it was melted down in 1918. The cathedral is the largest church of Germany, and was listed as a World Cultural Heritage by the UNESCO in 1996 (see also list of other UNESCO heritage sites). The most important treasure of the church is the shrine of the Three Magi, the largest gold reliquiary of Christianity and a masterpiece of medieval art. It was created between about 1184 and 1230 by Nicolaus of Verdun. The frontal piece shows the Adoration of the Magi (or Kings), actually showing four kings. The fourth one is King Otto IV, who donated the shrine. The cloth enshrouding the bones was dated to the 3rd century AD. The church Groß Sankt Martin [left, no. 1324: background centre] dates back to the 13th century. The massive square tower was completed in 1220, the nave was finished in the mid 13th century. During World War II, the church was competely destroyed but was reconstructed after the war.